PASADENA, Calif. (NASA PR) — Starting next year, scientists will get their first look deep below the surface of Mars. That’s when NASA will send the first robotic lander dedicated to exploring the planet’s subsurface. InSight, which stands for Interior Exploration using Seismic Investigations, will study marsquakes to learn about the Martian crust, mantle and core. Seismology, the study of quakes, has already revealed some of the answers here on Earth, said Bruce Banerdt, Insight’s principal investigator at NASA’s Jet Propulsion Laboratory, Pasadena, California. But Earth has been churning its geologic record for billions of years, hiding its most ancient history. Mars, at half the size of Earth, churns far less: it’s a fossil planet, preserving the history of its early birth. Seismometers, like InSight’s SEIS instrument, measure the size, frequency and speed of these quakes, offering scientists a snapshot of the material they pass through. Mars’ geologic record includes lighter rocks and minerals — which rose from the planet’s interior to form the Martian crust — and heavier rocks and minerals that sank to form the Martian mantle and core. By learning about the layering of these materials, scientists can explain why some rocky planets turn into an “Earth” rather than a “Mars” or “Venus” — a factor that is essential to understanding where life can appear in the universe. One challenge will be getting a complete look at Mars using only one location. Most seismology on Earth takes measurements from multiple stations. InSight will have the planet’s only seismometer, requiring scientists to parse the data in creative ways. InSight won’t be the first NASA mission to do seismology. InSight will measure more than seismology. The Doppler shift from a radio signal on the lander can reveal whether the planet’s core is still molten; a self-burrowing probe is designed to measure heat from the interior. Wind, pressure and temperature sensors will allow scientists to subtract vibrational “noise” caused by weather. Combining all this data will give us the most complete picture of Mars yet. JPL, a division of Caltech in Pasadena, manages the InSight Project for NASA’s Science Mission Directorate, Washington. Lockheed Martin Space in Denver, Colorado, built and tested the spacecraft. InSight is part of NASA’s Discovery Program, which is managed by NASA’s Marshall Space Flight Center in Huntsville, Alabama. This is an exciting mission. The basic questions of the makeup of the interior, whether Mars’ core is still molten and underground will tell us a lot about the possibility of life, help us better calculate the depth where liquid water could be found and inform us regarding terraforming. 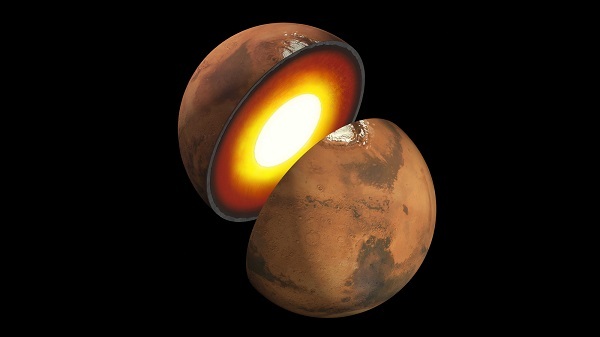 Mars’s lack of a global magnetic field argues against a convecting molten core which is supported by modelling the thermal evolution of the planet. Because Mars is relatively small, it will have lost much of its internal heat long ago. However, there are some suspiciously young-looking lava flows around Coprates Chasma which might mean there is a small amount of melt at relatively shallow depths. And let’s be honest, any look inside Mars will be fascinating. It’ll be good to know how thick the Martian crust actually is, whether it is homogeneous or if there are discontinuities and how different the crust is from the underlying Mantle. So my fingers are well and truly crossed this mission succeeds.